I'm no longer running naked! At running camp we talk about the joys of running naked. Now, before Larry reads this and says, "No wonder you like running camp so much," I need to explain. Running naked feels like freedom, just running without a care in the world, and without - a watch. I train for a marathon for four months. Every day when I run I check my watch every few minutes to see if I am on the target pace for that day's assigned run. Then I enter the time, pace, and daily mileage into my running calendar. And then during the marathon itself, I am constantly checking my watch to see if I remain at my target pace. That's why, in the month after the marathon, when I'm not officially in training, I so enjoy my watchless wrist, no pressure, just the joy of running. But when I strap back on the watch, the freedom of no watch (and, I'll be honest, slower runs) is traded for the excitement of a new marathon. A new city, a new state to run and party in - and this year, it will be a new country. Berlin beckons! After I finished The Boston Marathon, I realized I had run two of the five World Major Marathons. The Majors are the world's largest (and some say the most prestigious, as Boston certainly is by definition) marathons, in really cool cities to spend a long weekend (New York City, run by me in November '09, Boston this past April, and along with Berlin, Germany there's London, England and Chicago). So, being a numbers kind of girl, I got the idea to run all five of The Majors. The plan is to run Berlin on September 25, then run London next April, followed by Chicago (with about five others from my running camp) next October. At the end of a marathon, all the finishers are given a medal. I cherish the four medals I already have, and hope to earn many more. 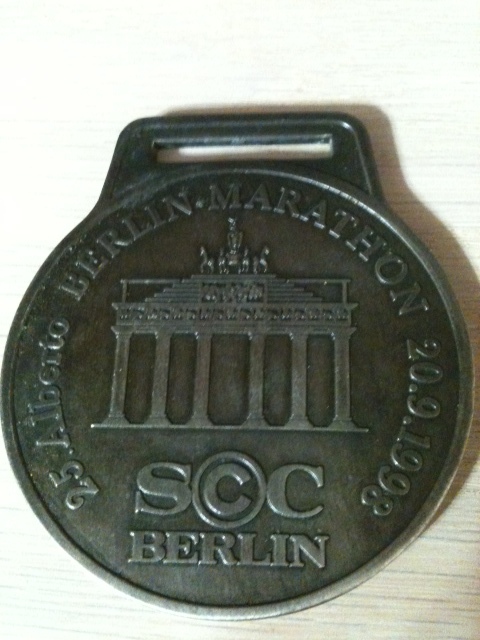 A crazy coincidence is that I already have a medal from the Berlin Marathon. When Danny was studying in Berlin last winter, he found a medal from the Berlin Marathon at a flea market and bought it for me. I remember thinking what a great gift it was, but feeling a little guilty that I had a medal from a marathon I hadn't yet run. I hoped, but did not yet know in March of 2010 that only 7 months later I would qualify for the Boston Marathon at the Mohawk Hudson River Marathon with a 32 minute PR, by 6 minutes and 47 seconds. But once I ran Boston, I knew it was time to run Berlin and earn that medal I already received. Berlin, here I come. Maybe this was meant to be!